New Mexico is one of 18 states that require most of their employers to pay a higher wage than the federal minimum wage of $7.25 an hour. New Mexico raised its minimum wage from $5.15 to $6.50 in 2008, then to $7.50 in 2009. The federal Minimum Wage Act of 2007 increased the national minimum wage from $5.15 to $7.25 over the course of three years. Because neither the state nor federal wages are indexed to rise with inflation, both have stayed where they were in 2009—despite the fact that inflation has made the cost of most goods and services higher. Some of New Mexico’s municipalities have enacted wage levels higher than the state’s minimum wage, but only the wage in Santa Fe is indexed. 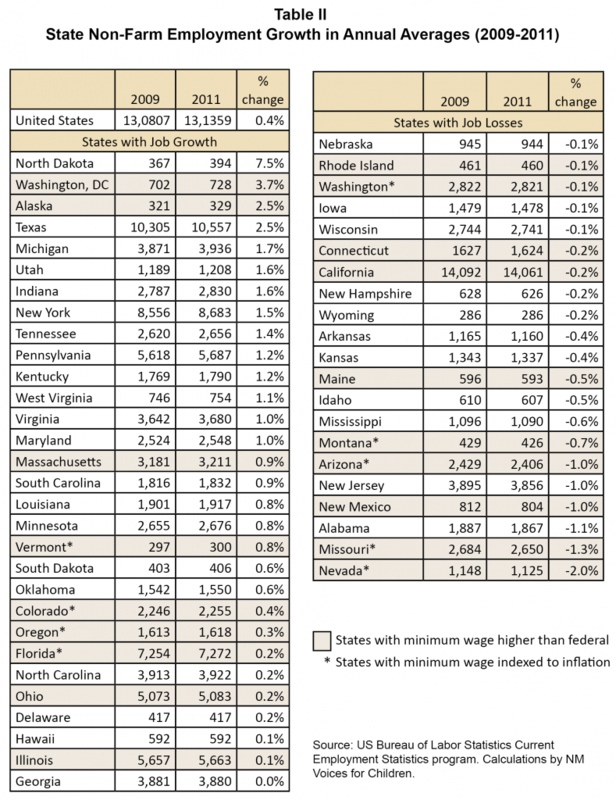 Since 2007, 18 states and the District of Columbia have set their state-level minimum wages above the federal level. Nine states—Arizona, Colorado, Florida, Missouri, Montana, Nevada, Oregon, Vermont, and Washington—have indexed their minimum wage to keep pace with inflation. Four states—Arkansas, Georgia, Minnesota, and Wyoming—along with Puerto Rico, have statutes setting minimum wage levels below the federal wage. Five additional states—Alaska, Louisiana, Mississippi, South Carolina, and Tennessee—have no state minimum wage. When the minimum wage is not indexed to inflation, its value falls by about 3 percent per year because inflation, as measured by the Consumer Price Index, is running at about 3 percent a year. 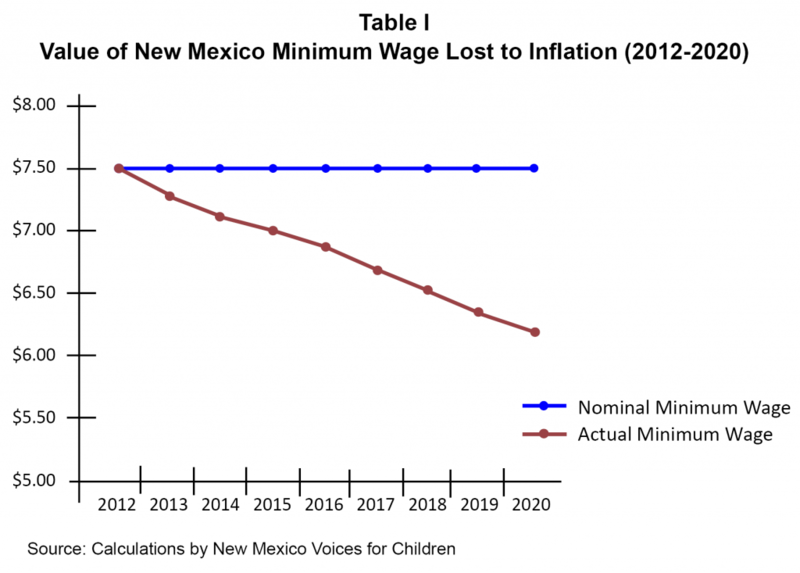 Table I shows how this will impact the New Mexico minimum wage over several years. By 2020, the real value of a minimum wage of $750 an hour will fall to $6.22, for a loss of $1.38 an hour. A full-time minimum wage worker would lose $2,870 each year as a result. Every time a legislative body moves to raise the minimum wage it encounters opposition, largely from business interests. Such opposition is usually accompanied by prognostications of certain economic doom. But research has shown that raising the minimum wage is actually good for the economy. 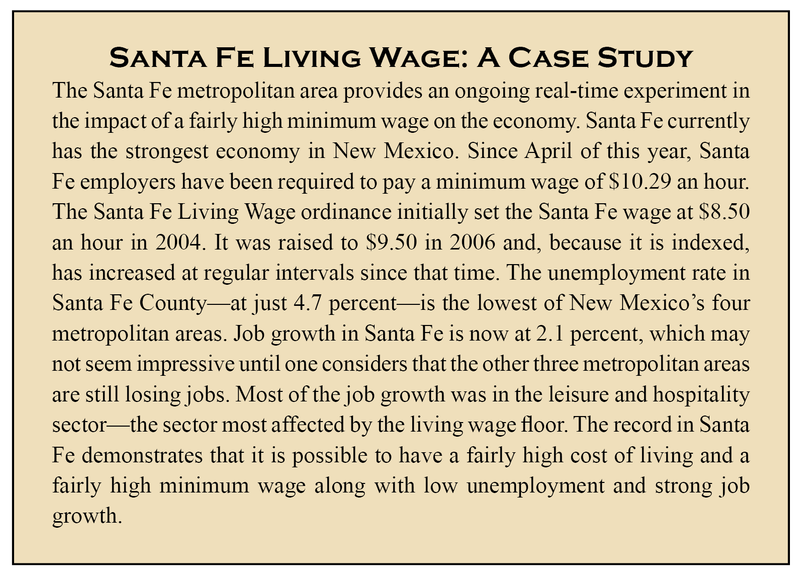 This paper will present estimates on the economic impact of raising and indexing the minimum wage in New Mexico. It will also describe the economic performance of states with a minimum wage higher than the federal level in four commonly used measures: job growth, poverty, state per capita personal income, and the proportion of hourly wage workers paid at or below the federal minimum. Raising the minimum wage does stimulate the economy, although modestly. Predictably, most of the impact of raising the minimum wage goes to low-wage workers. The Economic Policy Institute (EPI) recently released an estimate of the economic impact of a 25 cent increase in the New Mexico minimum wage. This is roughly the increase that would have resulted if the state wage had been indexed for a 3 percent rate of inflation. Of New Mexico’s 723,000 hourly workers, 36,000 would have received that 25 cent increase from $7.50 to $7.75. Another 23,000 hourly workers would have been indirectly impacted because, as the bottom of the wage scale moves up, wages for the next tier of low-wage workers are increased. The total number of affected hourly workers would be 59,000, or 8.2 percent of hourly workers. The EPI estimated that each worker would receive an average annual increase of $350. The total amount of increased wages would be more than $20 million. When low-wage workers receive wage increases, the vast majority of that money is plowed right back into the local economy. This is because workers earning low incomes generally have to spend their entire paycheck on day-to-day living expenses. They have little, if any, money left over for savings. Because of this new spending, the $20 million increase in wages would result in an increase of the state Gross Domestic Product (GDP) of $12.8 million. (The fact that the GDP for the state is lower than the wage increase is the result of some consumption from increased wages going to buy goods from out of state.) Increased spending leads to job growth and the EPI estimates that New Mexico would see 110 more jobs due to the economic impact. When looking at other states that have increased their minimum wage, we can conclude that it does not impact state job growth. About half the states that have increased their minimum wage saw employment growth as they recovered from the Great Recession.3 Job growth in those states with a wage higher that is indexed to inflation also did not seem to be impacted (see Table II). Based on the experience of other states during the recovery from the Great Recession, an increase in New Mexico’s minimum wage to $8.50 with indexing would not result in job loss. 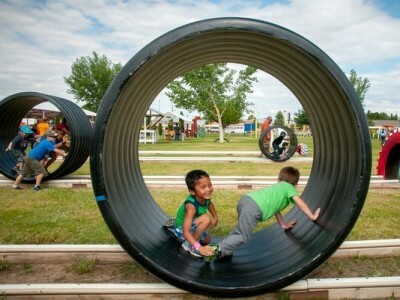 As noted above, a simulation performed recently by the Economic Policy Institute for New Mexico Voices for Children predicts a modest positive effect on employment. More than half of the states that have raised their minimum wage have poverty rates lower than the national average of 15.3 percent. Unfortunately, New Mexico is not one of the states experiencing a lower-than-average poverty rate. Clearly, while a higher minimum wage may help to alleviate poverty, many other economic factors are at work. The overall rate of economic growth and whether the benefits of that growth are spread across the population will have a stronger impact on poverty than the higher minimum wage. Still, the higher minimum wage is important (see Table III). 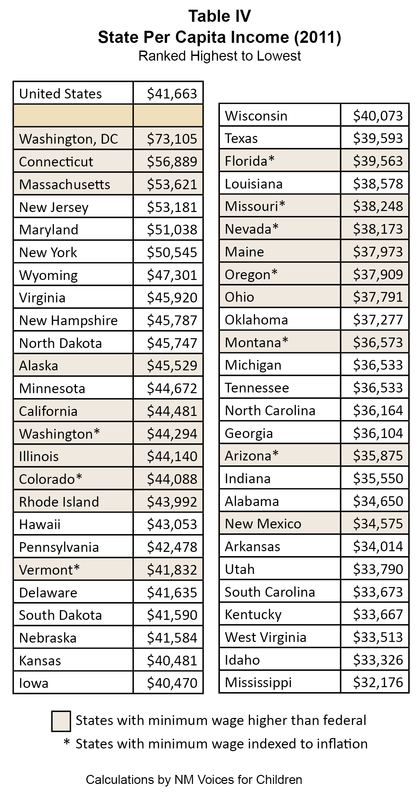 Half of the states that have a minimum wage above the federal level have a per capita income higher than the national average. Per capita income is the most commonly used measure of economic performance and is determined by dividing the state’s personal income by the state population. Personal income includes all earned income from wages and salaries, unearned income from dividends, interest and rents, and transfer receipts such as Social Security and Medicare. 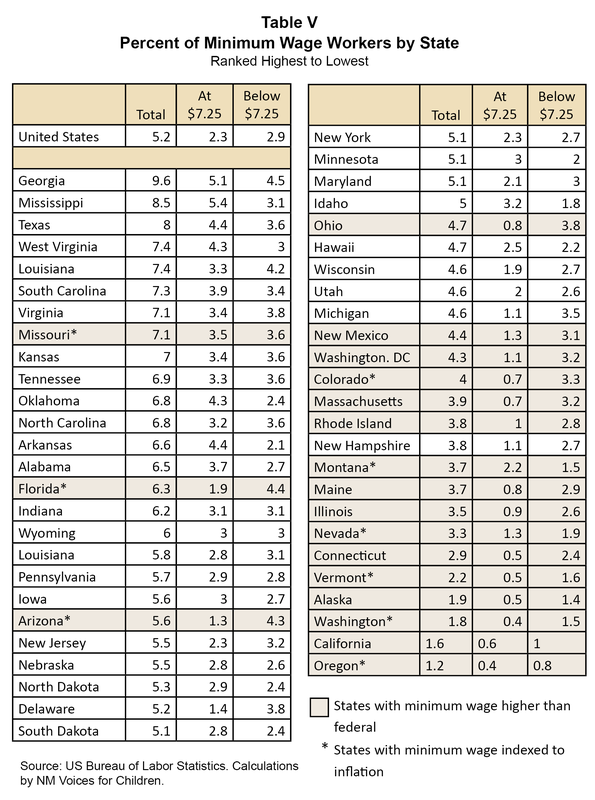 Clearly, having a higher minimum wage does not damage a state’s economic success as measured by per capita income (see Table IV). In 2006, before the state and federal minimum wage increases, almost 6 percent of New Mexicans earned the minimum wage. This was double the national average at the time of approximately 3 percent.4 Now, because New Mexico’s minimum wage is higher than the federal, the portion of New Mexico’s hourly workforce that is paid the current federal minimum wage is lower than the national average. Raising the state minimum wage to $7.50 has been a clear success in that New Mexico no longer ranks at the top by percentage of low-wage workers (see Table V). State lawmakers should raise the state minimum wage and index it to inflation during the 2013 legislative session. Doing so will actually give a modest boost to the economy and create more than 100 jobs. New Mexico’s low-wage workers would earn a combined $20 million more each year, much of which would be spent right here in New Mexico. 1. “Fair Labor Standards Act of 1938: Maximum Struggle for a Minimum Wage,” Jonathan Grossman, US Department of Labor, http://www.dol.gov/oasam/programs/history/flsa1938.htm. 2. History of Federal Minimum Wage Rates Under the Fair Labor Standards Act, 1938 – 2009, US DOL, http://www.dol.gov/whd/minwage/chart.htm. 3. Current Employment Survey conducted by the U.S. Bureau of Labor Statistics. 4. Other states with a higher-than-average portion of minimum wage workers include Louisiana (5%), Oklahoma (close to 5%), Texas (almost 4%); Colorado (close to 4%), Arizona (about 3%) and Utah (almost 3%).